Denis Villeneuve’s “Prisoners” possesses a remarkable precision in nearly every aspect of its execution. It is palpable in the mood, the performances, the script from Aaron Guzikowski, and especially the photography by Roger Deakins. As the abduction of two children forces a father (Hugh Jackman) to extreme measures of extracting vengeance, the film patiently and methodically follows his descent into an inhumanity on par with his daughter’s abductor. At times, Villeneuve’s realization of this unraveling feels so airtight that it comes across almost as stifling and constrictive. Somehow, the film feels like it needs to breathe. Yet on further inspection, that is not the case. Villeneuve knows exactly how much oxygen “Prisoners” needs to survive and refuses to dole out any more of it than is necessary to give each scene a pulse. This makes his film burn not only slowly but also consistently, illuminating the depravity of cruelty to children with its steadfast flame. His exactitude directly counters the nature of the narrative, a complicated ethical story with neither an easy outlet for sympathy nor a character that lends his or herself to identification. The closest figure offered for a connection is Jake Gyllenhaal’s Detective Loki, whose adherence to rationality and order makes him the most level-headed presence in “Prisoners.” He retains a rather detached perspective on the case of the missing girls rather than allowing himself to succumb to the levels of hysteria from the grieving families. If everyone else in the film yells, Loki speaks in a whisper. 2009 has been a great year for animation, particularly in the advances that were made in leaps and bounds this year. Wes Anderson used stop-motion animation to bring “Fantastic Mr. Fox” to life. Although they hesitate to call it animation, James Cameron and Robert Zemeckis continued to perfect the motion capture technology, the former practically reinventing it. To top it all off, our good friend Pixar, faithfully churning out magnificent movies year after year, had perhaps their finest moment yet with “Up,” and the Academy may just reward it with only the second Best Picture nomination for an animated film. But what about old-fashioned, hand-drawn animation? “The Princess and the Frog” is one of the best movies of the year not because it sets out to revolutionize its craft or because it tries to impress us with its bravura; in fact, it’s such a joy because it does just the opposite. It sticks rather simply to the way animation was done in the good old days, and it has the beautiful charm to make you feel like you did as a child watching the Disney animated classics. “The Princess and the Frog” is able to channel the rapture of the golden age of animation while combining it with a more contemporary ethic. It doesn’t entirely belittle the power of wishes and dreams, which movies like “Cinderella” and “Snow White” trained us to believe was all you needed. But the movie’s main lesson is to teach the value of working hard to achieve your dreams, which is just what Tiana (voice of Anika Noni Rose, “Dreamgirls”) does. She works two jobs in New Orleans so she can open the restaurant that she and her father (Terrence Howard) dreamed about when she was a child. He is the main voice echoing in her head, always saying that you cannot rely on the cosmos to give you what you want. 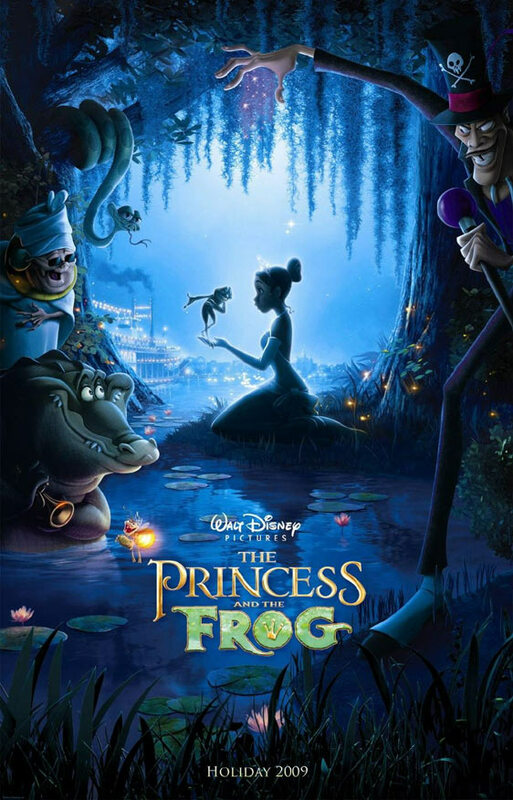 However, in a moment of desperation, she kisses a frog who claims to be a prince in hopes that she will get the fairy tale ending of “The Frog Prince.” But the frog doesn’t become a prince; Tiana becomes a frog thanks to a voodoo priest (Keith David) that is creepy on a level I reserve for villains like Jafar and Scar. The two must travel through the bayou to reach Mama Odie, a voodoo priestess that can set things back to the way they are. To navigate the perilous terrain, they enlist a trumpet-tooting alligator named Louis (Michael-Leon Wooley) and a thickly accented, love-struck firefly named Ray (Jim Cummings). The journey is filled with plenty of spirited musical numbers and enough fun to make your smile as wide as the Mississippi.